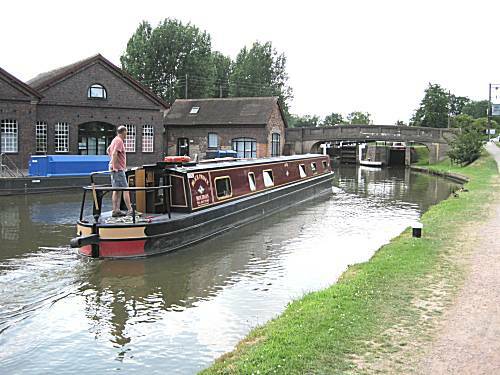 They left Napton (Near Rugby) on Saturday 26th June taking the Grand Union to Kingswood Junction, there turning onto the rarely used Stratford Canal, they travelled its entire length to join the River Avon. 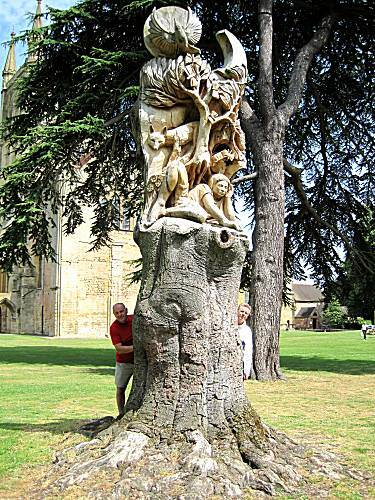 They were then swept downstream along the Avon towards and into the giant River Severn at Tewkesbury. Making the difficult turn there they reached Gloucester, where they explored the historic docks. Leaving Gloucester they battled upstream all the way to Stourport, there joining the canal system again to make their way past Wolverhampton. 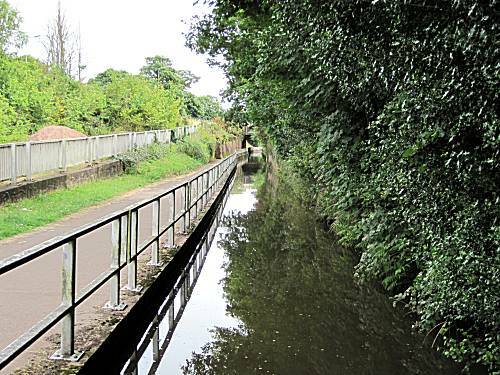 Due to vandalism on the Birmingham and Fazeley canal they changed their route to travel the Trent & Mersey Canal necessary to divert around the closed canal. 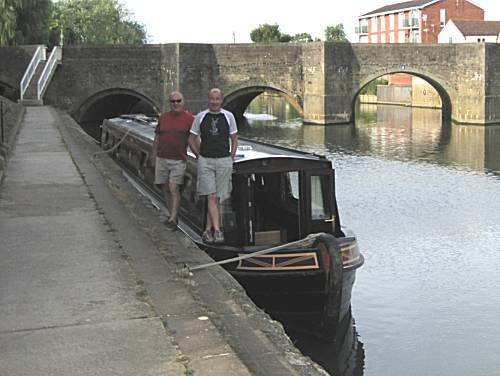 On Wednesday 7th July, they managed to rejoin their original route down the Coventry Canal to wind their way back to Rugby and the safety of the boatyard. The crew met at Alan's House at 9am for the start of yet another spine chilling expedition of danger and boatmanship. Both Neil and Ron arrived ahead of schedule in eager anticipation of the adventures ahead of them. Neil swiftly transported them to Sainsburys in Rugby, where despite the considerable building works, they were able to procure all the necessary provisions for their mammoth expedition. Extra supplies of smoked mackerel fillets were obtained in readiness for difficult times ahead. But no Pork Pie was obtained, as Neil had cunningly pre-purchased the essential supplies in case of pork pie famine. 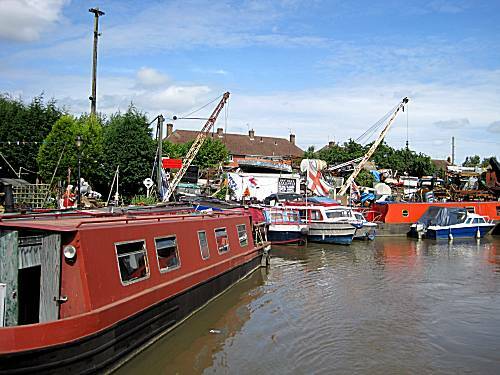 The crew arrived at the boat yard, who had previously allocated them "Narrowboat Olive" being the flagship of the fleet and allowed them an immediate departure, dispensing with all the usual formalities necessary with crews of lesser capabilities. 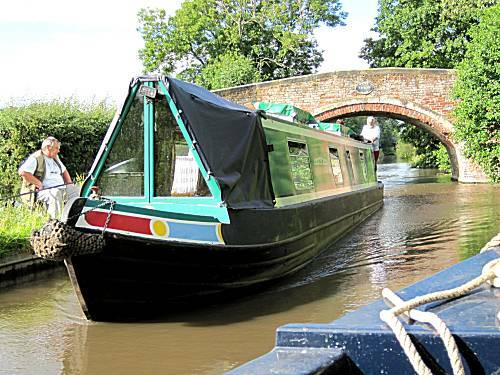 The narrowboat was pointed towards the exit of the marina and they set off into the unknown at 12-45 towards their planned stopping point for the evening at Long Itchington, scheduled to take 5 hours. 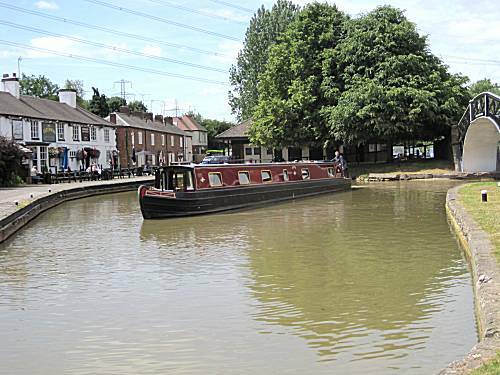 Despite heavy traffic in the other direction, 13 giant locks and 4½ miles, the narrowboat drew into its mooring adjacent to the "Two Boats" public house in a mere 2¼ hours. 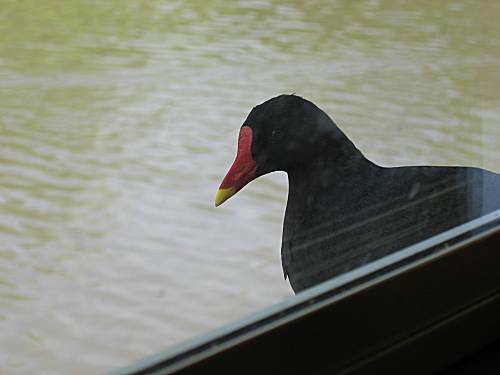 The locals were amazed to see Ron guide the boat into the confined mooring space with little difficulty. The extreme hot weather necessitated the weary crew taking on extra fluids and they therefore hurried to the "Two Boats" where they found Adnams Broadside on offer, which suited their needs well. After a sufficient fluid intake they took the opportunity to enjoy gammon steaks with pineapple and egg. The crew returned to the boat at an early hour and retired without the benefit of cheese, biscuits or coffee. Due to their early night the crew rose at an unearthly early hour and after porridge cast off to tackle another taxing day. 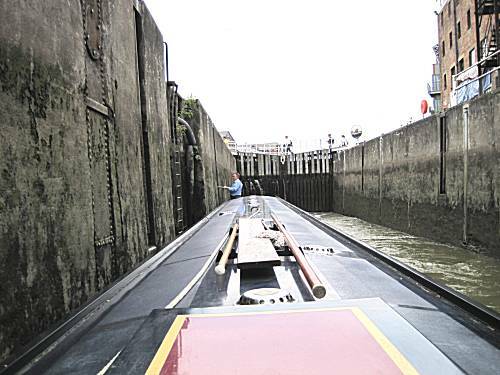 The first 10 locks including a double staircase lock were passed with little effort, as the crew compassionately 'buddied' up with another narrowboat with less able crew. They quickly passed through Leamington Spa in the sunshine, knowing that the feared 21 locks of the Hatton Flight lay ahead of them. Despite the extreme heat, the crew declined to stop at the 'Cape of Good Hope' as they passed Warwick. The considerate crew chose to help a craft, with inexperienced crew, by doubling up during the preliminary Cape Locks leading to the main Hatton Flight. 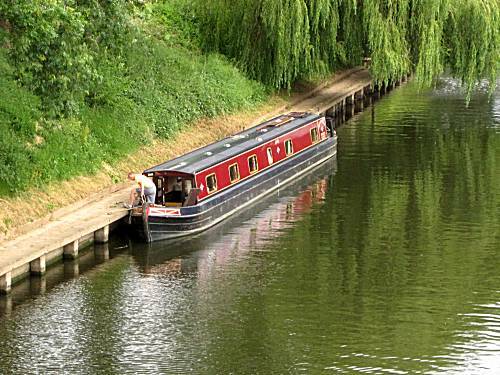 However, they soon failed to cope with the stress and rapidly took the turning into the Saltisford Arm into the safety of Warwick town centre. Passing the boatyard indicated that they only had 15 further giant double locks to reach the summit. 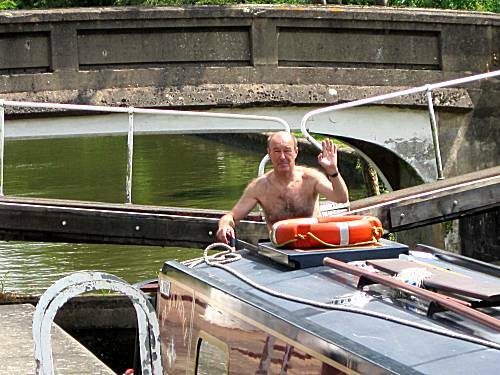 Neil's special hand signal indicates to the other crew that they have successfully reached Hatton Top lock. The captain immediately orders them to moor up and watch the England v Germany match, much to the obvious relief of the other crew. Although dinners of Ham & Egg, Bangers & Mash, together with Chicken Balti were enjoyed by the crew sitting outside at the Navigation Inn, they felt that the beers were only average and therefore walked to an up-market establishment known as "The Boot", where they were served London Pride by a number of attractive Australian barmaids. The crew returned to the boat to enjoy a little cheese and biscuits with their coffee, whilst discussing the successes of the day. The crew awoke early realising that they had moored close to a railway line and after porridge set off into the unknown Stratford Canal. 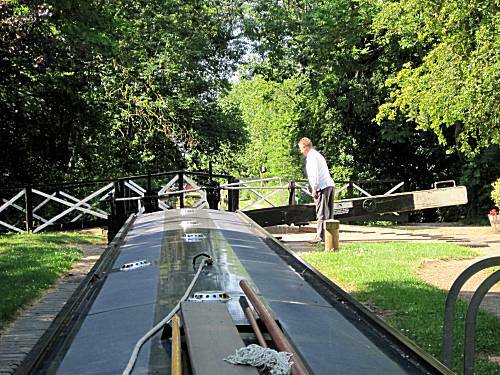 The tight turn was accomplished with precision by Ron, before Alan took the boat through the next series of single locks. 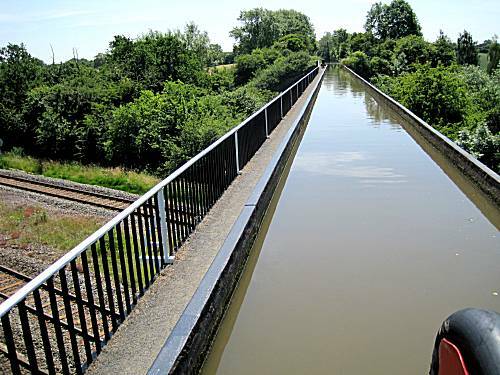 The crew were bewildered by the tiny single locks and low narrow bridges on this canal, but soon adapted to the requirements. 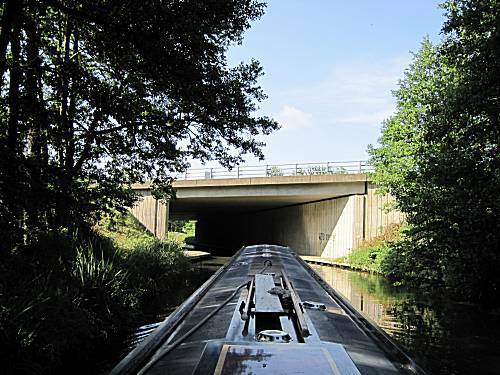 Again the canal boat travelled beneath the mighty M40 motorway, but the crew took this in their stride. However, they were soon alarmed to find that they had to cross a dangerous aqueduct and stopped to prepare a healthy breakfast before tackling the obstacle. The local council closed the road beneath in case of disaster, but the fearless crew proceeded without distress on to the next stage of their mission. 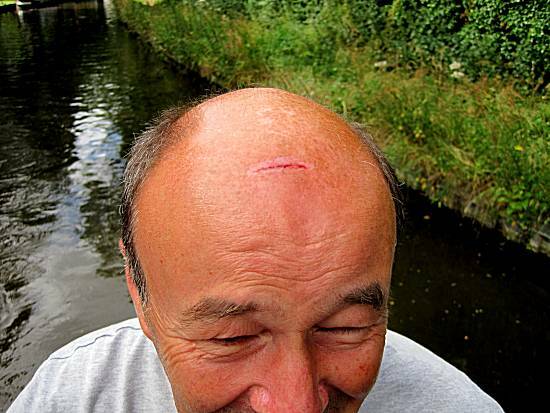 A Grave injury occurred when a low flying bridge (seen on the right) hit Neil on the head. Despite the enormous loss of blood he gallantly continued the mission with little disruption. The atmosphere was tense as the crew slowly manoeuvred the narrowboat across the Edstone Aqueduct, much the amazement of the locals. 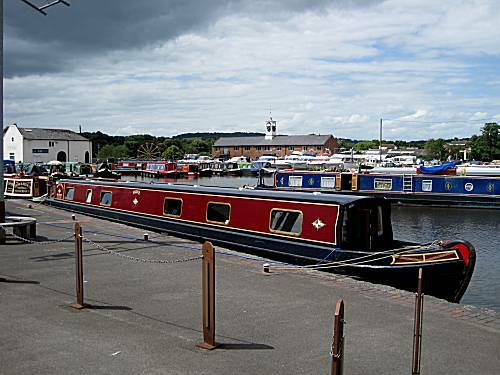 The staff at the Bancroft basin in Stratford had reserved a prime mooring location for the Narrowboat Olive, in recognition of the crew's tremendous achievement. 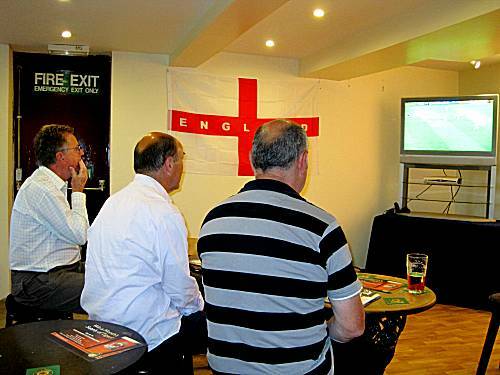 The crew cunning located a Wetherspoons in Stratford and enjoyed steak dinners whilst watching a little football. Abbot Ale was consumed at a cost of a mere £1-65 per pint. 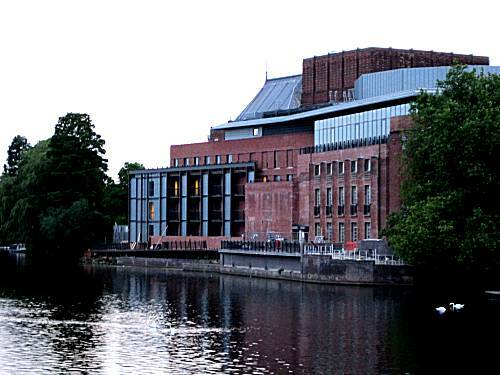 After dinner the crew were amazed to see the giant Royal Shakespeare Theatre. The crew returned to the boat for the coffee with a little cheese and biscuits, before retiring to listen to the rain beating on the roof. The crew were awoken at an early hour as the Stratford-upon-Avon cleaners used heavy machinery to polish the street. An early morning expedition to the shops secured a non-stick frying pan, tape, cherry tomatoes and bread rolls, but no Pork Pie. After porridge the crew set off, quickly negotiating the final lock to enter the River Avon. All to quickly the series of strange metal locks unfolded in front of the crew. The skilled crew very quickly adapted to the new locking arrangements, swiftly and accurately passing one after another. 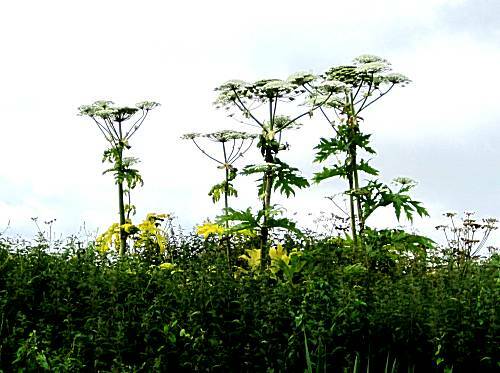 The crew were quick to identify quantities of the toxic Giant Hogweed growing alongside the river. The crew concentrated their efforts and superior powers towards the plants, which were soon seen to wither and die. The locals were greatly impressed and thankful to the crew for ridding them of this pest. 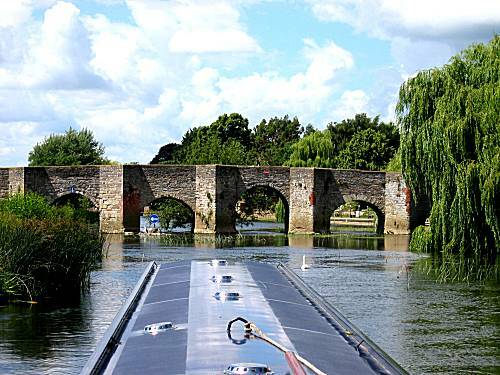 By lunchtime the famous Bidford-on-Avon bridge came into view. Passing through the only navigable arch the crew were quick to locate a mooring spot in the shade next to a water point. The crew hurried into the town, but were again unable to locate the source of any of the necessary giant Pork Pies. However, individual pork pies were located and the crew returned to set up a picnic to feast upon the pies in the sunshine. After the welcome break the crew continued towards Evesham, which was their planned stopping point for the night. 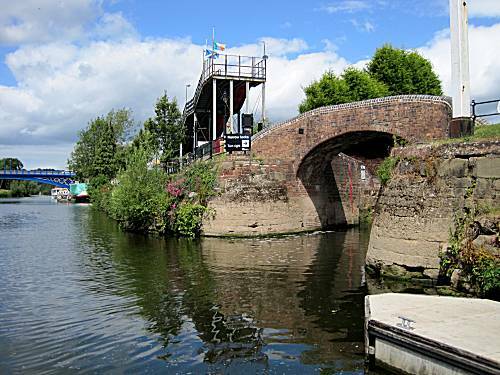 The giant hydraulically operated lock at Evesham, presented little difficulty for the experienced crew as they pulled in to Evesham well ahead of schedule. An excellent mooring spot was selected and the crew hurried to investigate the town. A Pork Pie shop and Wetherspoons public house were quickly located where the crew felt need to sample shandys (Except Neil). They noted that Tuesday evenings was "Steak Night" with reduced prices and a free pint of ale and vowed to return later. The crew diverted their return trip to the boat to investigate the historic abbey gardens, providing a reverend understanding for the day. They returned to the boat much enhanced by this experience. 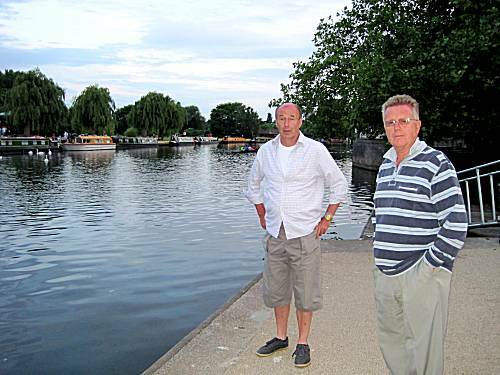 After relaxing in the sunshine by the boat, the crew showered and readied themselves for a night in Evesham. 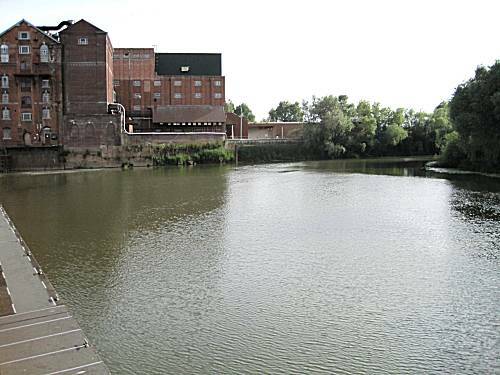 They had previously investigated the facilities at the giant Gloucester Docks and realised that entry into the docks was only permitted to experienced crew due to the considerable dangers created by commercial shipping. The crew were not daunted by this fact. 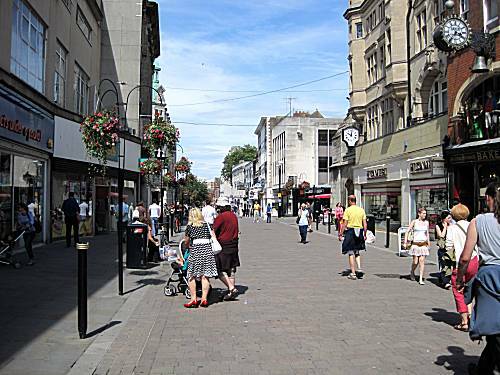 Although the steak dinners and Abbot Ales, with a little Ruddles was to their liking, they were somewhat disappointed with the Town, which proved not to be the expected 'Middle England', but a little down market and having large numbers of migrant workers congregating and drinking by the river. The crew were unable to manage any cheese or biscuits and retired content with the enormities of the achievements of the day. However, they knew that to keep to their punishing schedule they must reach Tewkesbury by the following evening. The crew awoke fresh and ready for the tasks ahead of them. As they finished Neil's delicious porridge they again cast off into the unknown lower reaches of the River Avon, not knowing what might face them today. Progress during the morning was excellent and uneventful. They therefore took the opportunity to make a lunchtime stop at Pershore to investigate the area and prepare a healthy lunch. They enjoyed the healthy lunch of Pork Pie, sandwiches and salad followed by fresh fruit salad in the shade of a nearby tree. 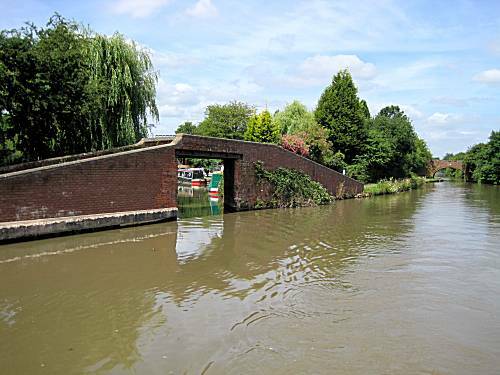 After lunch the crew proceeded onwards towards Tewkesbury, mindful of a number of dangerous locks still to be negotiated. 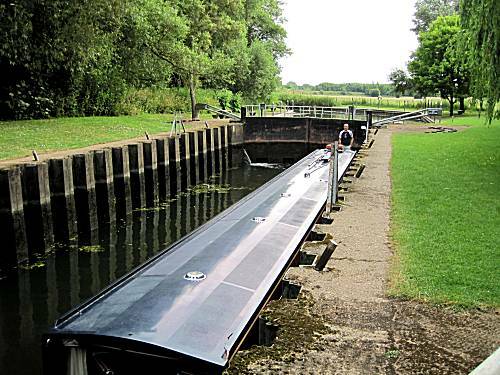 The crew were perplexed by the giant lock shaped like a coffin. They dismissed thoughts that this might be a bad omen. The mission continued with just 7½ miles to reach their goal for the evening. 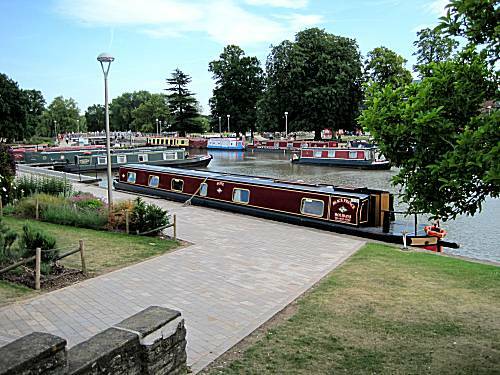 The crew were nervous as they approached Tewkesbury, knowing that mooring in the town centre was strictly limited. 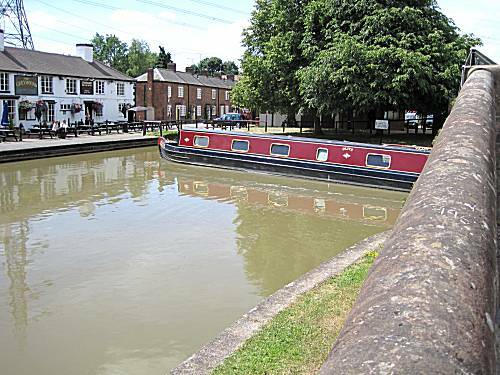 However, the crew should not have worried, as the previous lockkeepers had phoned through reserve a prime position for the narrowboat adjacent to the lock. 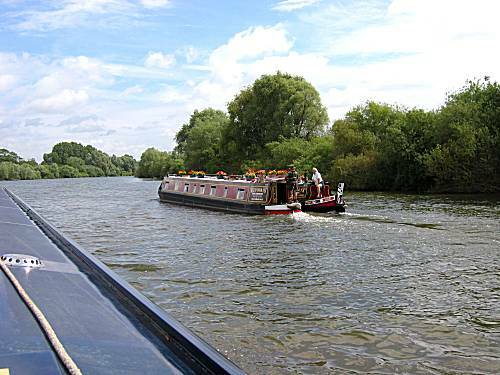 The crew immediately consulted the helpful lockkeeper, who explained the grave dangers that they would experience when entering the dreaded River Severn. 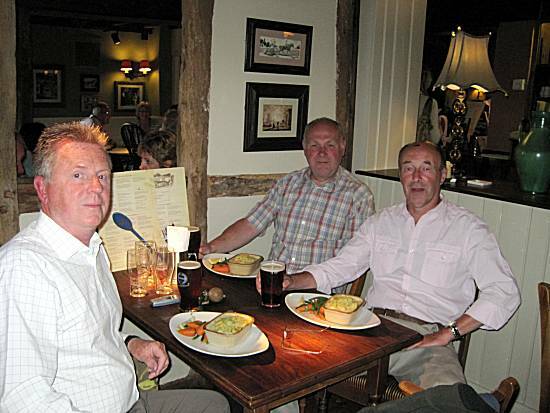 They enjoyed their last night of safety by choosing from the enticing range of curries on offer at "Ye Old Black Bear" in Tewkesbury. Chicken Tikka and Chicken Madras were chosen, but Ron selected a more healthy option. The 6X ale accompanied the curries well and afterwards, after exploring the town on foot, they cunningly located a Wetherspoons pub "The Royal Hop Pole" for a final pint of Abbot Ale to help them sleep and try to forget the difficult journey they would encounter down to Gloucester Docks in the morning. 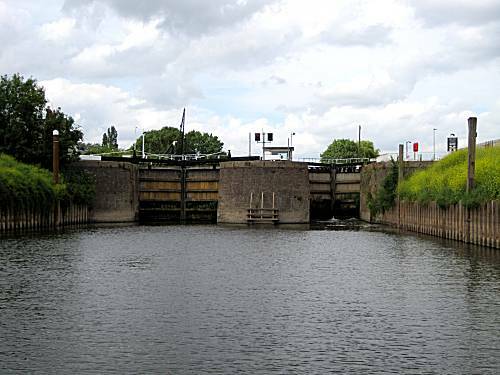 The crew were unable to travel through the giant lock into the River Severn until the lockkeeper came on duty at 9am. Although planning to have their second cooked breakfast of the adventure, their nerves got the better of them and Neil therefore prepared a little calming porridge with some toast. They moved up early to fill their tanks with fresh water, in case of emergencies. The lockkeeper allowed the crew through the lock early giving them some last minute words of advice, but the crew had already studied their charts sufficiently. 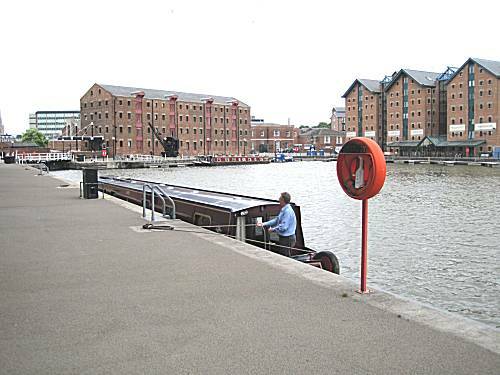 Alan radioed ahead on Channel 74 to the Gloucester Dock lockkeeper who was able to empty the lock and swing open the gates to make their journey into the safety of the lock much easier. Holding the boat still in the giant Gloucester Lock can prove difficult, but the crew managed without effort. The lockkeeper directed them to the prize mooring location in the docks to a tremendous welcome from all the staff and locals. 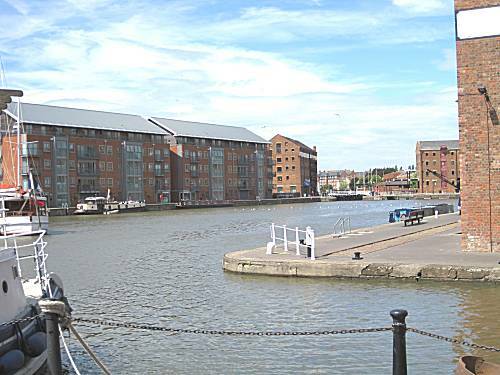 In recognition of their successful trip, the crew awarded themselves "Feast" ice-creams and enjoyed them whilst gazing across the giant Gloucester Dock at the narrowboat, belittled in the distance. 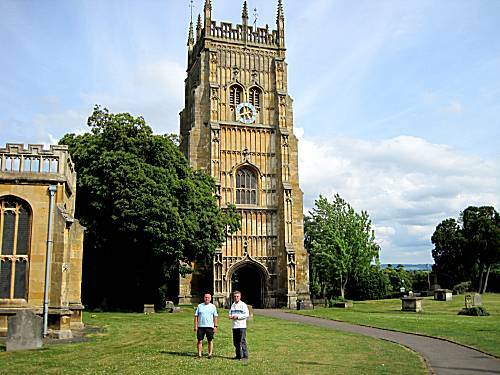 Alan checked out the location of the nearest Sainsburys Local in very centre of Gloucester. The crew felt difficulty travelling through this strange environment, but successfully obtained fresh supplies of Bread, Milk and Smoked Mackerel Fillets, together a supply of home made 'Gloucester Old Spot' pork pies from the butchers next door. They returned to the boat to ready themselves for a night of celebration on Gloucester, aware that they must battle upstream on the River Severn all the way to Worcester the following day. The crew set off unable to protect themselves from the forecasted inclement weather conditions. They quickly located 'The Fountain Inn' where quantities of Bath Ales 'Gem' was identified (Except Ron). Although the responsible crew chose 'Fish Pie' dinners, they were disappointed to find that these were unavailable. They therefore selected very healthy Salmon dinners (except Alan), including asparagus, together with new potatoes. After a number of additional pints of Gem ale (except Ron), the crew left the establishment to return to the boat for very small healthy portions of cheese and biscuits, together with Ron's coffee. The crew retired to their cabins, in quiet anticipation, nervous of the demands of the following day. The crew slept well, knowing that they had achieved the first of the many goals that they had set themselves and awoke later than planned. 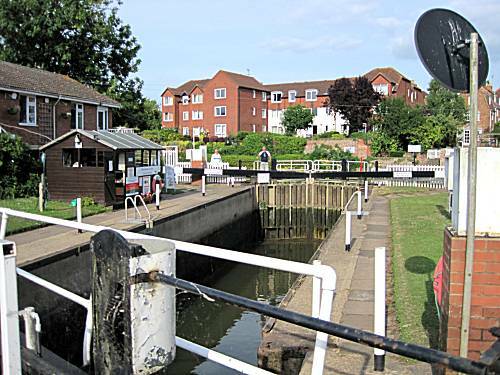 They finished their porridge as Alan contacted the lockkeeper by radio, who immediately filled the lock ready for the next stage of their important mission. 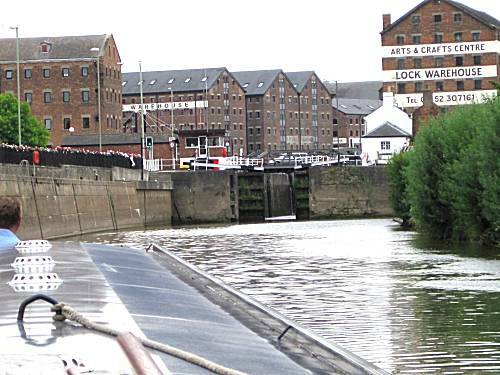 The lockkeeper wished the crew well as they left the safety of Gloucester Dock, closely controlling the boat as it hit the fast flowing waters of the River Severn. The journey, battling against the current up the river went well until they came across 2 narrowboats tied together and having inexperienced crew. Once the crew realised that they were not in immediate danger, they swept past the craft, using their incredible power and then slowed to guide the other craft safely to the next lock. The crew realising that they had only had one cooked breakfast on the entire trip, vowed to prepare another today in order to keep their strength up for the even more difficult times ahead. Ron selected Upton-on-Severn as a possible location for this treat and they powered onwards towards this goal. 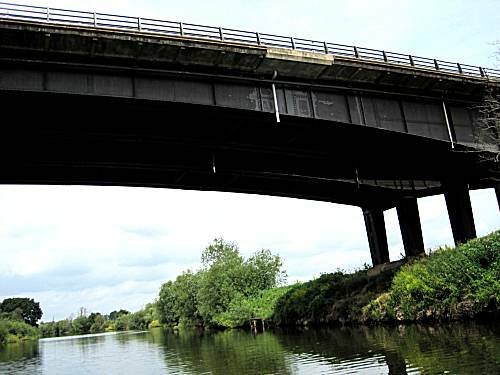 The crew marvelled at the giant structure supporting the M50 motorway. Again no fear could be detected on the crew's faces as they passed beneath. 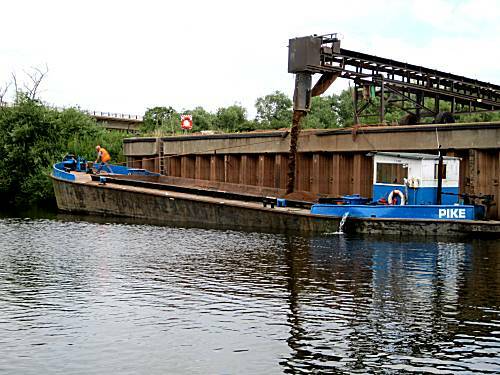 The crew were pleased to see a huge commercial vessel that was using the river for transporting gravel. 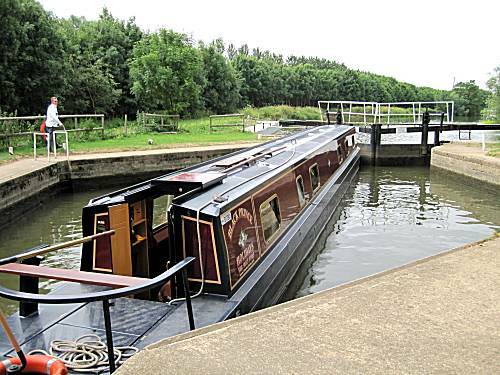 The crew of this vessel immediately secured their craft to avoid endangering the incredible progress of Narrowboat Olive. The narrowboat drew gently into Upton-on-Severn, but alas no mooring was available for the boat and their brave crew. 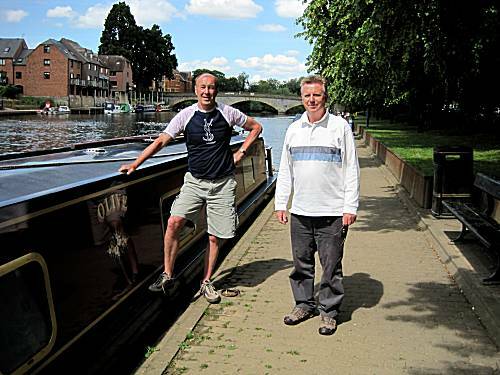 Their breakfast/lunch was therefore taken in relays as the narrowboat battled onwards towards Worcester, their planned destination for the evening. 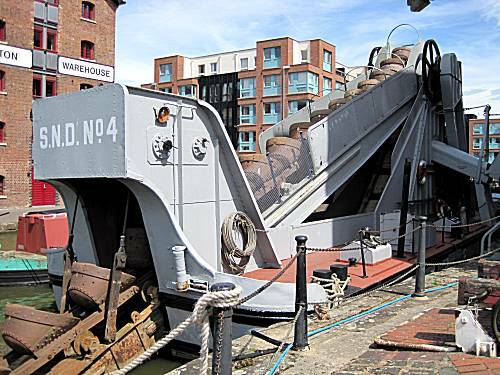 They were hoping to find mooring on the river, although an option to turn onto the canal was available to the crew. 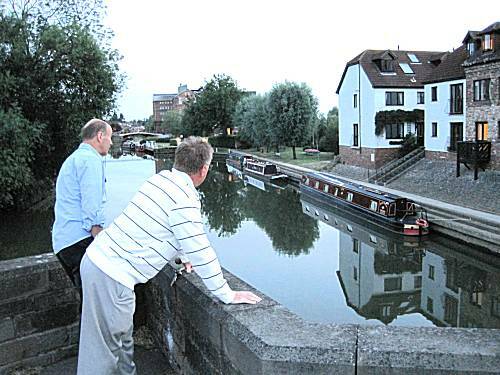 One further giant lock lay between them and their evening's entertainment, which is known to the locals as Diglis Lock, because of its difficult exit route. 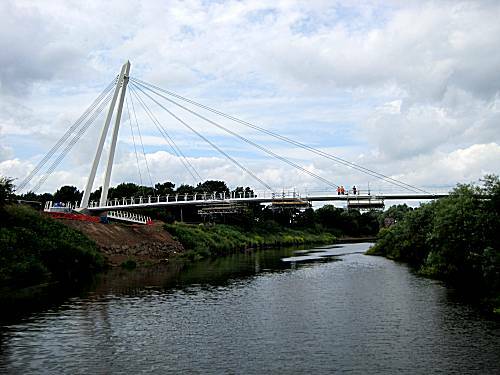 Before long the currently being constructed Diglis pedestrian bridge came into view. The crew were most impressed, but knew that the giant Diglis Locks would be just round the corner. The crew cunningly located a quiet mooring spot adjacent to the racecourse and having arrived ahead of schedule rested in the warm sunshine. After a suitable rest the crew readied themselves for a night out in Worcester. The first pint purchased in "The Plough" proved disappointing, being served in dirty glasses and generally the place looked a poorly run establishment. Afterward they hurried to "The Postal Order" being a Wetherspoons premisies. The pub was crowded and noisy, but they ordered Abbot Ales, together with BBQ Chicken dinners, except Alan who had an excellent Steak and Ale pie with veg and mashed potatoes. After a small amount of World Cup football, they left Wetherspoons, calling in at "The Rectifying House" for one pint of a strange light coloured ale, before returning for coffee on board the boat. 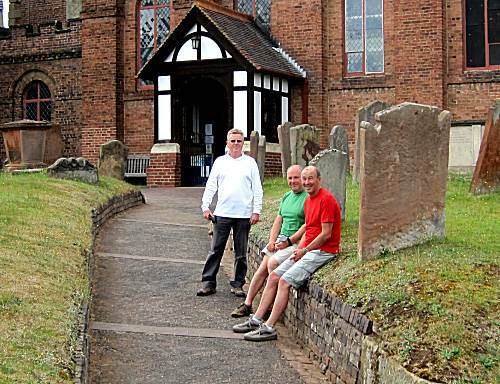 The crew did not stay up long after their exhausting day and retired in anticipation for another long river cruising day up to Stourport, where they intend to leave the River Severn and join the Staffs and Worcester Canal, marking another successful stage of their epic journey. The crew expected a restful night, but this could not be guaranteed. The crew slept well, not rising until 7-55am after their evening in Worcester. 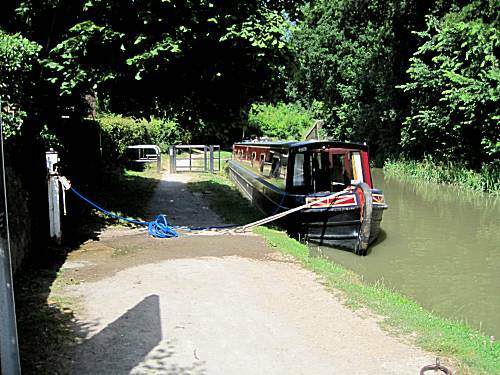 The crew left their moorings only too conscious that their mooring fee of £3-50 had not been collected. 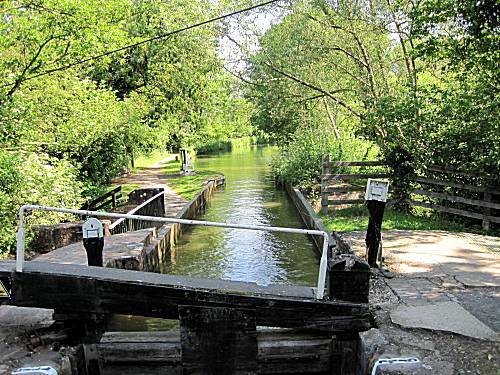 The first of the three locks to be encountered on this section of the river was swiftly passed with ease, with the friendly lockkeeper wishing them well, but warning them of low water conditions ahead. The crew were confident that their skills would prevail. 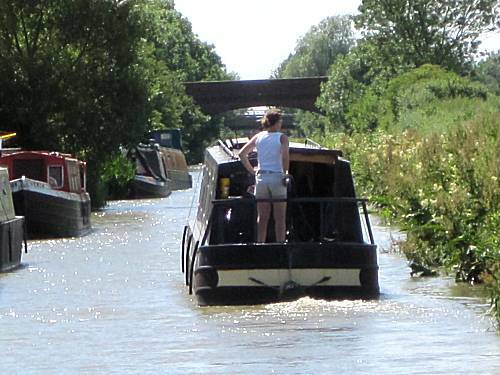 A narrowboat, not maintaining a satisfactory rear lookout, was encountered, weaving dangerously across the waterway, shortly before Holt Lock. The crew swept past, using all available power, to steal their position in the lock. The last of the remaining three locks at fast flowing River Severn at Lincomb was successfully passed and the crew looked out for the tight turn off the river onto the narrow Staffs & Worcester Canal at Stourport. 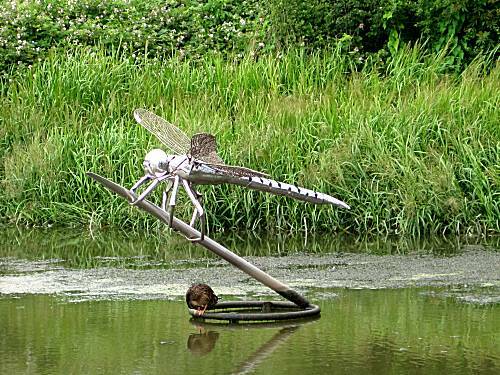 Although cunningly disguised, the crew successfully made the turn off the River Severn, despite the strong currents. 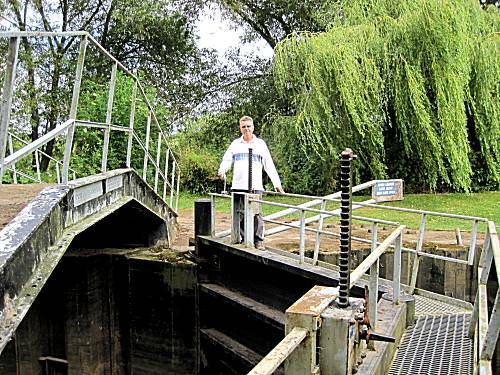 Immediately they encountered 2 double staircase locks into the dreaded Stourport Basins. Alan guided the boat through a series of tight turns narrowly missing other carelessly moored boats to reach the water point, where they were able to refill their dangerously low fresh water tanks. 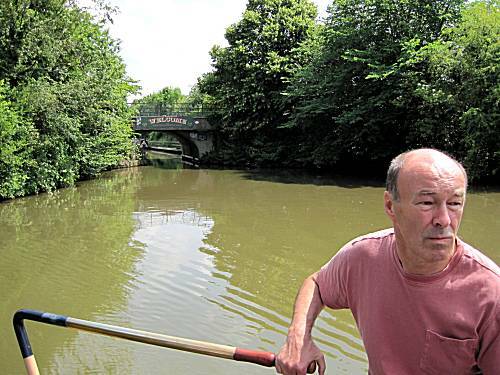 Such was the relief upon reaching the safety of Stourport from the River Severn, Neil quickly prepared a lunch of Pork Pie (Gloucester Old Spot variety), together with egg sandwiches and salad. Freshly prepared fresh fruit salad afterward completed the treatment and the crew were able to relax for the first time since their adventures began. 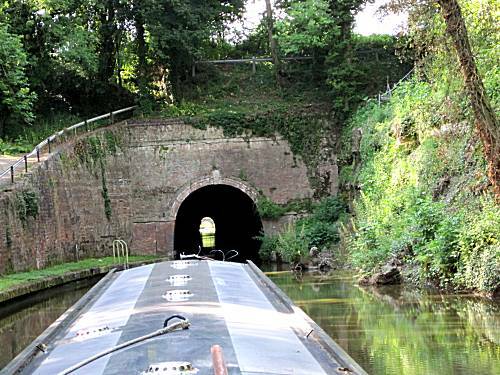 The crew were horrified by the narrow winding canals that took them out of Stourport on the next stage of their incredible journey, but this did not stop their determination. The crew could hardly believe their luck when, passing through Kidderminster, they were able to stop at Tescos and stock-up on their depleted provisions supplies. Quantities of whole grain bread, orange juice, reduced price strawberries, satsumas, bananas and nectarines, were procured. The crew awarded themselves to Magnums (Gold Variety) in recognition of their incredible performance to date. The crew were in awe of the splendid converted buildings in the centre of Kidderminster, as they continued their epic journey. 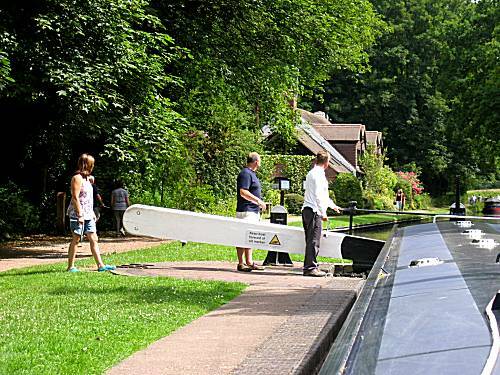 Going ahead of schedule, the crew strived to reach the village of Wolverley for the evening. Although mooring spaces were at a premium, they hurried to investigate the delightful little village and were humbled to find that the locals had put on a festival in their honour. Barbequed food, beer and a live group were there to entertain them. As is customary, in these circumstances, the crew made their way to the local church and can be seen here paying their respects in quiet solitude. The crew later returned to enjoy healthy fish dinners (except Ron) at the Queens Head and listen to the live music laid on for them until nightfall. The crew returned to the boat for coffee, whilst they planned their following day. Alan considered that they may try to get even further ahead of schedule by attempting to reach Compton or even Tettenhall for Sunday night, but they were all well aware of the dangers. They retired to the bunks early (except Alan), who worked into the early hours studying the charts and looking for ways to achieve yet another goal. The crew unfortunately slept in later that planned rising at 7-55am. Although the crew set off immediately after Neil's particularly pleasing porridge, they suffered irritating delays for most of the day and found themselves behind many craft with inexperienced crew. These crippling delays threatened to curtail their mission. 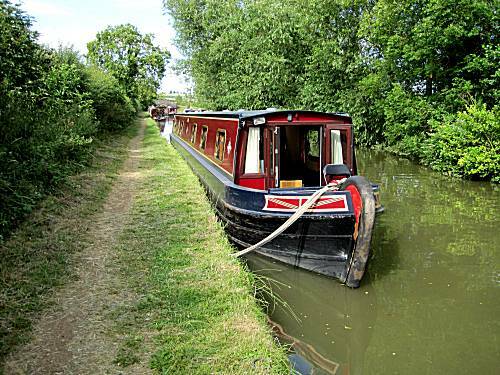 "Replacing their sheets and duvet covers"
A narrowboat, having inexperienced crew, chose to pass moored boats in an inappropriate place, putting both boats in grave danger. Only through Neil's extreme skill averted certain disaster. 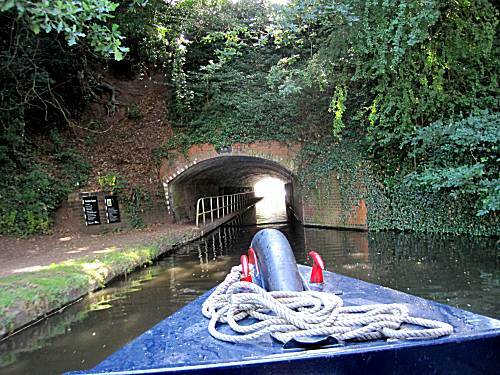 No incidents occurred in the Cookley Tunnel (65yds) with the boat under Neil's tight control. 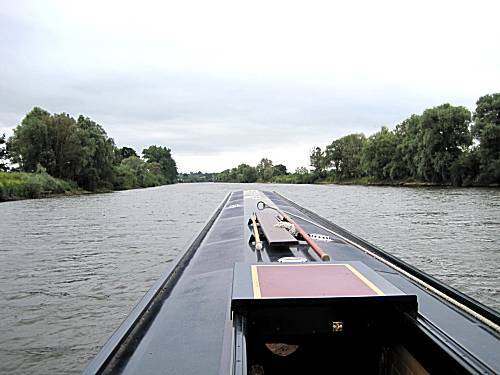 Although the crew were forced to follow several painfully slow boats through lock after lock, using their advanced negotiation skills, they successfully carried out a number of daring overtaking manoeuvres. The narrow dangerous rocky section of the canal, caused the crew great stress. Whilst passing Rocky Lock, the media again contacted Alan for another live interview on Tempo FM. 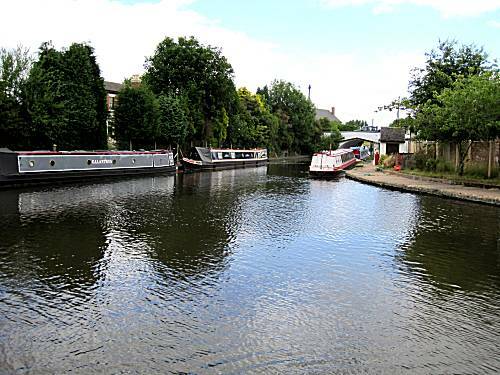 The attention of the crew and passers by was drawn to a life threatening incident on the canal that cannot be mentioned here for legal reasons. Despite the delays, the crew stopped briefly to refill their fresh water tanks and took the opportunity to enjoy hot dogs, with French mustard (except Ron). Portions of their remaining pork pie were taken at the same time, with salad and cup-a-soups (except Ron). 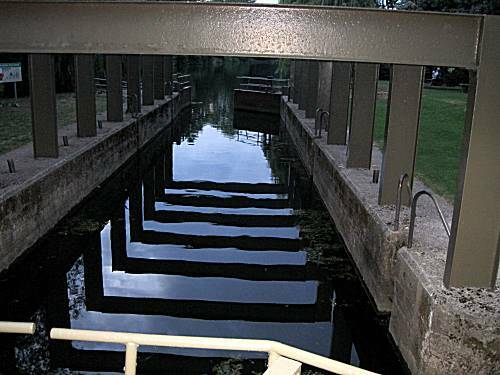 Further delays were encountered at the Botterham Staircase locks, when it was apparent the other canal users were incapable of operating the heavy complicated machinery. The crew came to their rescue and enabled the mission to continue. 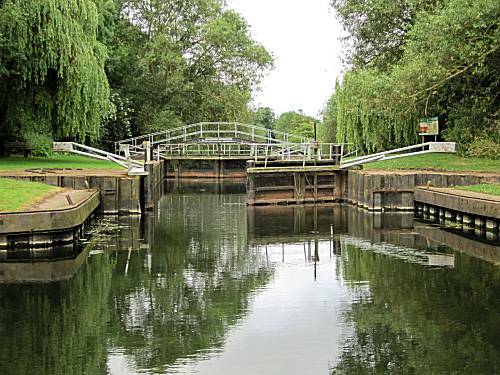 The timing of the arrival at the famous "Bratch Triple flight of locks" was perfect and transition of the feared obstacle was achieved in a record time. Neil can be seen here in high spirit knowing that this massive flight of locks would not delay the crew. 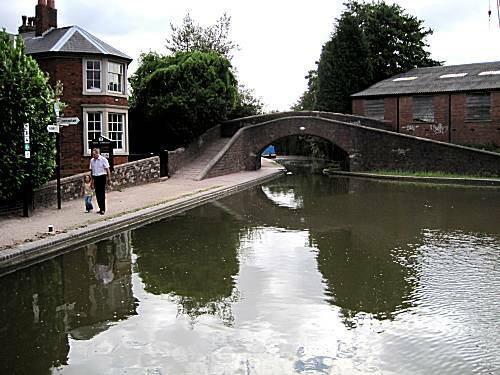 The narrowboat arrived at Wightwick at 6-30pm and the crew hurried to enjoy nourishing Fish Pie dinners at "The Mermaid"
MISSION COMPLETION ENDANGERED - During the day rumours of major damage to the Birmingham & Fazeley Canal were emerging. On returning to the boat, information was sought to establish whether this might endanger the crew's mission. From the Waterscape website, it appeared that this was indeed the case and that few alternatives remained open to the crew. They therefore immediately prepared coffee with cheese and biscuits and retired to their bunks not knowing whether completion was any longer an option. Sleep came difficult to the crew that night. 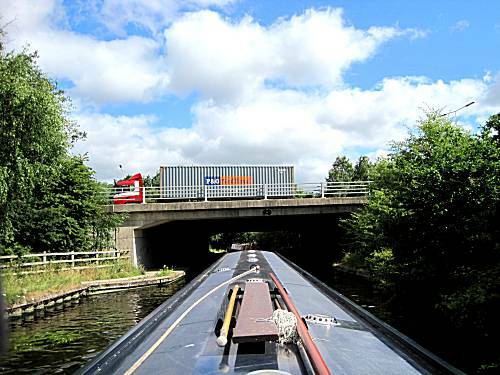 The narrowboat would be taken past the Wolverhampton turn at Aldersley Junction, continuing northward into unknown territories. 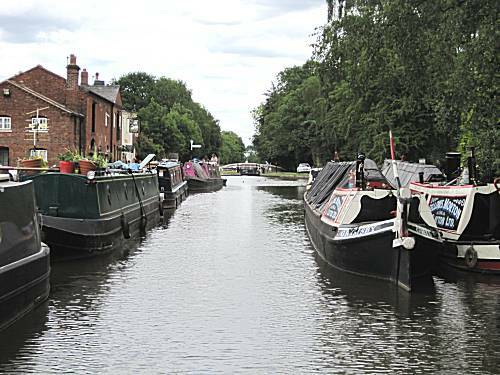 They would also go past Autherley Junction (The start of the Shropshire Union) continuing on the Staffs and Worcs to attempt to reach Haywood Junction by nightfall. Turning onto the Trent and Mersey canal eastwards they would pass the giant toilet factory at Armitage and travel all the way to Fradley Junction, turning right onto the Coventry Canal. 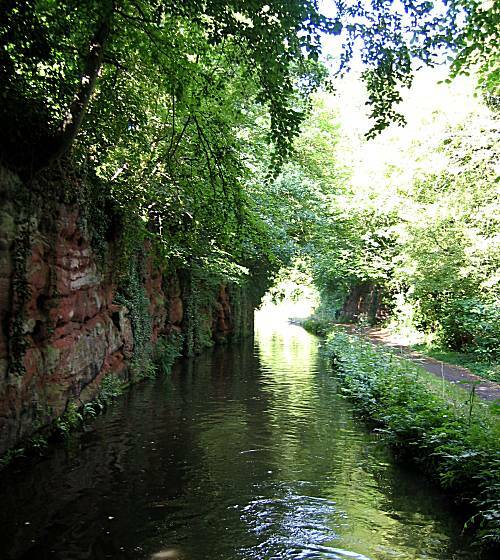 Travelling down this canal they would eventually meet the Birmingham and Fazeley Canal at Fazeley Junction where they would re-join their original route. The crew were jubilant at this cunning diversion of the breached section of the canal, but realised that it would require super human endeavour and endurance. They were also aware that this would rule out a visit to Birmingham and the promised Chinese dinner at Tin-Tins that they so deserved. However with characteristic endeavour they continued onward through more difficult waters. 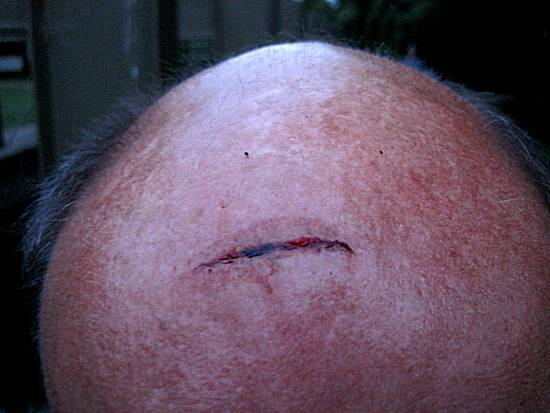 During the night Neil picked off his scab leaving a nasty visible gash. However, the other members of the crew, although disgusted, were astonished to witness his incredible healing powers. 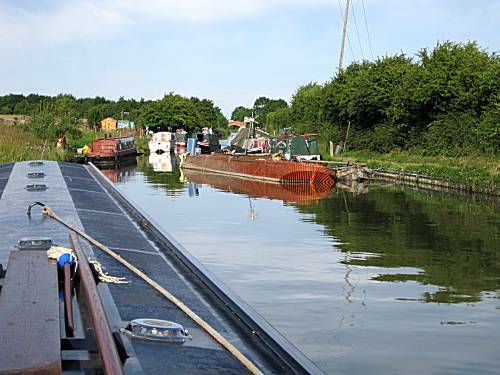 The crew battled on towards Haywood Junction hoping to make the village of Great Haywood for overnight mooring. CRIPPLING DELAYS HIT THE CREW - Although initially progress was good and the crew even stopped at Autherley Junction to purchase additional maps necessary for the foreign waters ahead, as the day unfolded it became apparent that the narrowboat was following a number of other slow craft through the 12 locks. 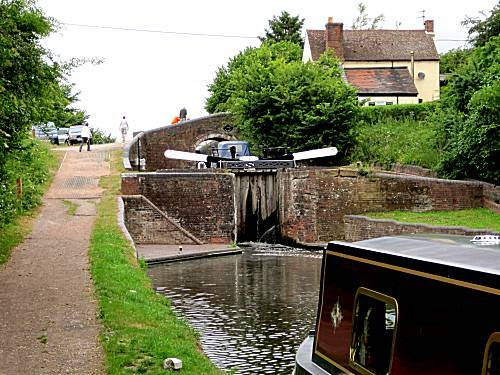 Delays of up to an hour at each lock caused great frustration and realisation hit the crew that their planned destination for the evening (Great Haywood) might be impossible. 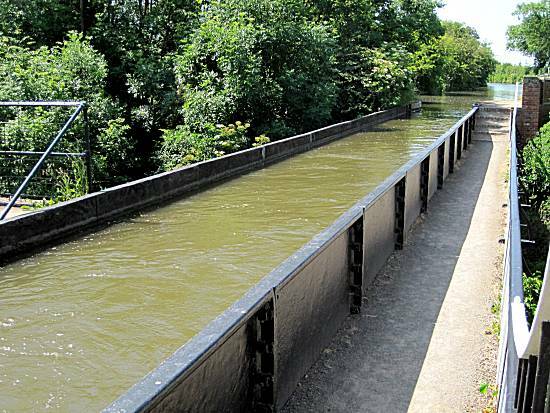 The crew made the best use of their time by filing with water at Gailey Lock and studying their new charts. However, the situation seemed hopeless!! The responsible crew also kept their super brains active, whilst passing Hatherton Junction, to learn how the old Hatherton Branch, seen here, had been used to carry coal from the Cannock Colliery until 1949, when it fell into disuse. The delays continued lock after lock and the crew knew their chances of success were slipping away. 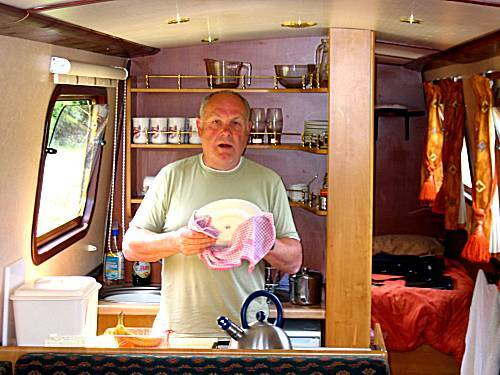 Neil therefore prepared the crew ham sandwiches with a hard boiled egg each and tomatoes. Delay curing cup-a-soups were also prepared, which lifted the spirit of the crew tremendously. 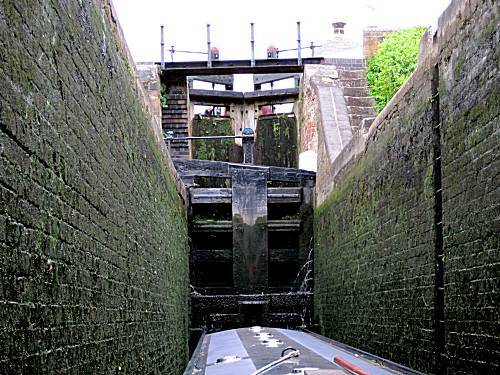 As a direct result of the Fresh Fruit salad that followed, the crew noticed that, before long, the length of queues at each lock had reduced and, if they continued at this pace, success might again be within their grasp. Whilst success was so tantalisingly close, disaster was only narrowly averted when yet another craft travelling at high speed loomed out from under a bridge! The offending craft had not been maintaining a forward lookout or using the correct signals. As night was falling and when the sight of the famous 'Tixall Wide' came into view, the reality dawned on the crew that their goal for the day might actually be possible. Before long the crew were preparing to moor for the night and cunningly located a superb spot just after 'Swivel Bridge' No 108. 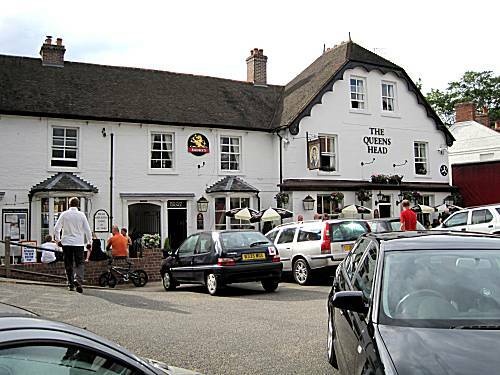 In the failing light the crew selected the Clifford Arms in Great Haywood for their night's entertainment and hurried to enjoy Adnams Broadside together with Madras and Thai curries. Afterwards the crew returned to the boat tired and exhausted after their relentless journey. They discussed the torturous plans for the following day and retired without the benefit of coffee, cheese or biscuits. The crew had a particularly peaceful night in the tranquillity of Great Haywood, knowing that they had just managed to maintain their torturous schedule. They rose earlier than normal eager to get underway, hurriedly consuming their porridge, before casting off. 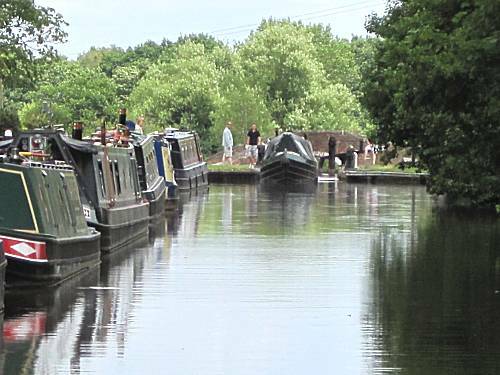 Several boats had already passed them before they set off and they feared yet more queues at the next lock. Consulting the charts Alan informed the other crew that they would be having a relatively lock free day until they reached Fradley Junction. 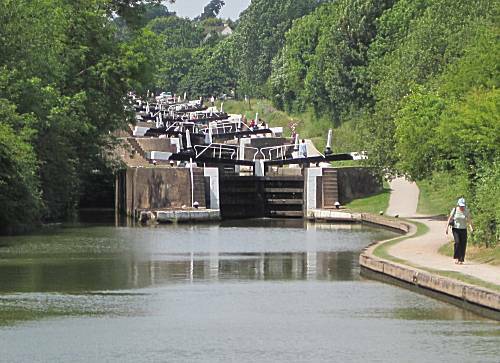 The crew were relieved to hear this news and even more pleased to pass the first two locks with minimum delays. Neil prepared bonus toast with morning coffee, much to the crew's delight. 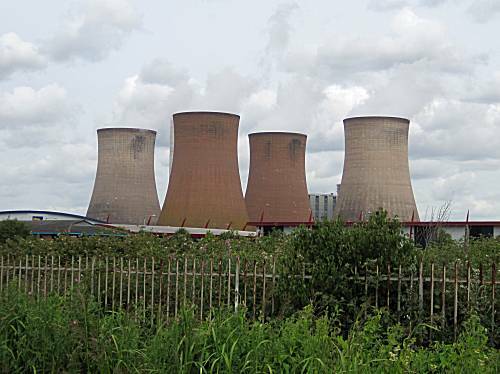 It was established that they would be passing a Morrisons by bridge 66 in Rugeley and Neil having carried out detailed a stock inventory in the galley and prepared a shopping list, which included bread, milk, tomatoes, bananas and pork pie. Neil advised the other crew that a smoked mackerel salad would be on the menu for lunch. 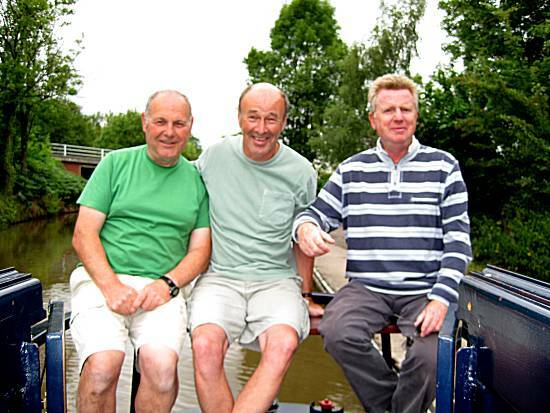 All was happy and content as the narrowboat gently cruised eastwards on the Trent and Mersey canal. 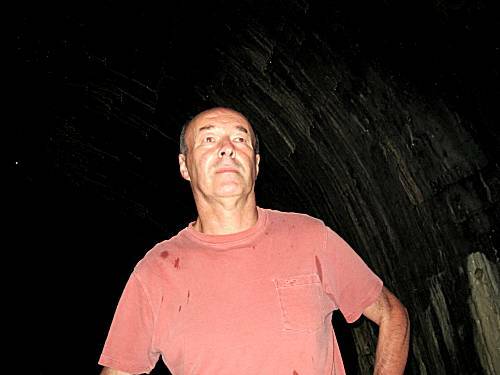 Tensions rose as the Ron carefully guided the narrowboat through the notorious 'Plum Pudding' narrows, that was once a tunnel, before mining subsidence forced them to open it out. 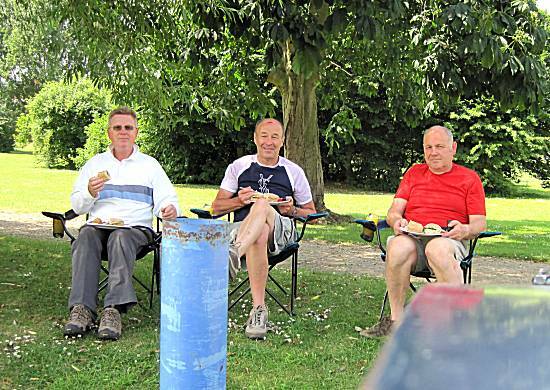 The crew moored up ½ mile short of the Fradley locks to enjoy their smoked mackerel salad, which was enjoyed with just a taste of the recently purchased pork pie (lattice variety). Energy releasing Orange Juice with Harrogate Spa Water (sparkling) was also administered and greatly appreciated by the crew. Queues to get into the locks were endless, however the crew played a cunning card. Ron manoeuvred the boat into shallow water and it was soon stuck hard on the bottom and immovable. The queuing boats feeling sorry for the crew waved them forward and using the narrowboat's incredible power, they were soon on the move. 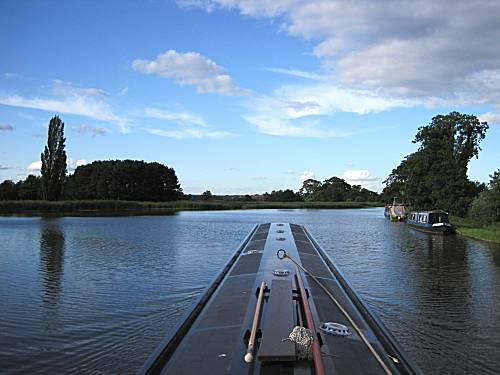 Once through the three Fradley locks the crew found themselves unable to make the right turn at Fradley Junction due to the number of inconsiderably moored boats. However, using their advanced turning skills the 70 ft narrowboat was soon facing the right direction and heading down the Coventry Canal. A young lady rushed to open the swing bridge for the crew, so as to minimise any delays, to their important journey, towards their destination for the night at Hopwas. 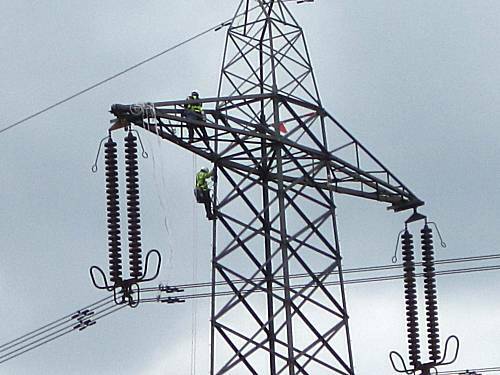 The crew shared their kindred spirit with other brave individuals seen working at great heights. 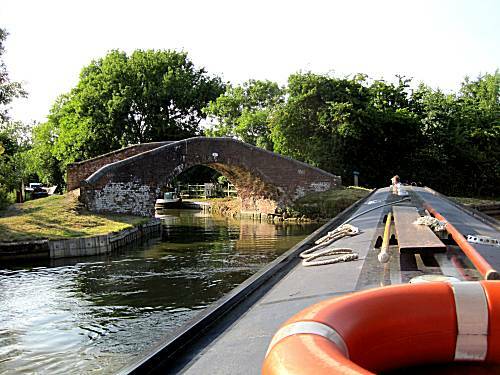 Despite the crowded canal system, the skilled crew were still able to reach their planned destination with ease, mooring at a perfect spot in Hopwas, just before School Bridge. The crew (except Alan) were keen to see the Uruguay v Holland semi-final at 7-30 and Neil hurried to find out which of the two pubs in the village were showing this spectacle. He returned with stories of large screen sets in cosy bars with real ale at the Red Lion and the crew fell for it. The football was watched together with steak dinners, served by attractive young waitresses, in the bar accompanied by Bombardier Ale (poor quality) followed by Abbot Ale (better quality). 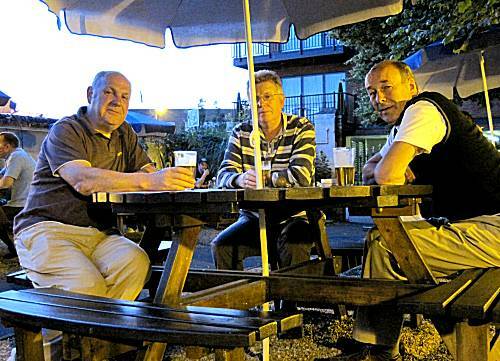 Afterwards the crew called for a final pint in the Tame Otter opposite and consumed this in the pub garden. 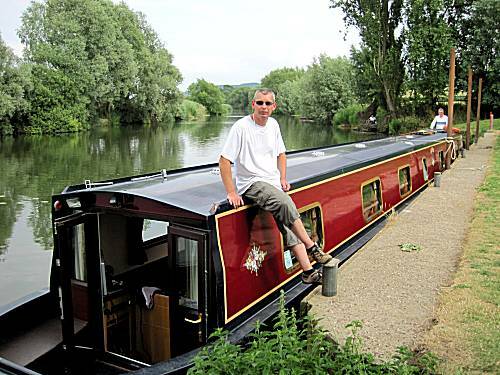 Afterward the crew returned to the boat for coffee without cheese or biscuits and watched a Tom Jones documentary, now that he has reached the age of 70. Options for the following day's travel were discussed and Polesworth, although not an inspiring destination, was achievable before midday and prior to the expected rain in the afternoon. 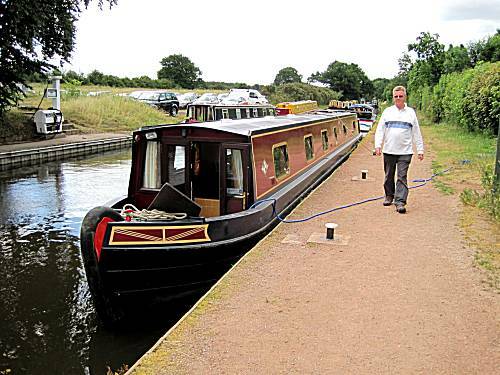 Alternatively a more ambitious option would be to press on to The Anchor at Hartshill, but this may incur a drenching!! Alan looked up times for buses from Polesworth to Tamworth, which could add a new dimension to the trip. The crew retired their bunks to consider the options. The crew awoke early leaving their moorings immediately after porridge, keen to get as many miles under their belts, before the onset of any rain. Cunningly the crew spotted fresh water supplies available at the BWB offices in Tamworth. 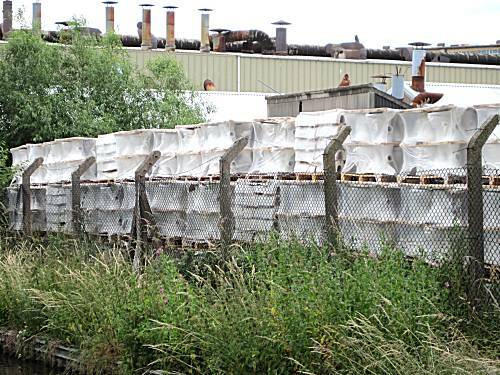 They filled their tanks to the very brim knowing that water may not be available through the depths and darkness of Coventry!! 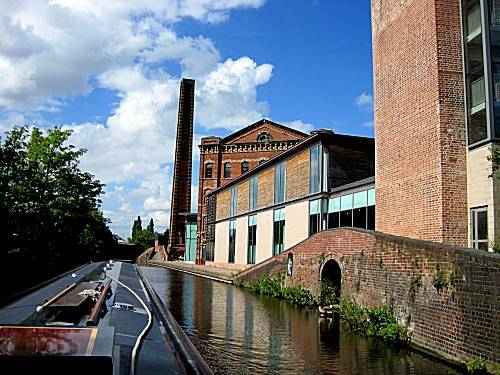 The crew were jubilant, when passing Fazeley Junction, as they realised that the giant diversion of the breached Birmingham and Fazeley Canal had been successful. As 10am passed, the weather was still holding and they already had passed the two locks necessary for them to reach Polesworth. The expedition continues, back on its original route, much to the obvious relief of the crew. 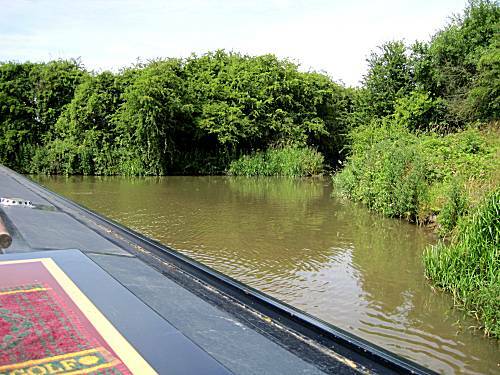 Some time later the narrowboat drew safely into Polesworth waters and the crew had a dilemma. 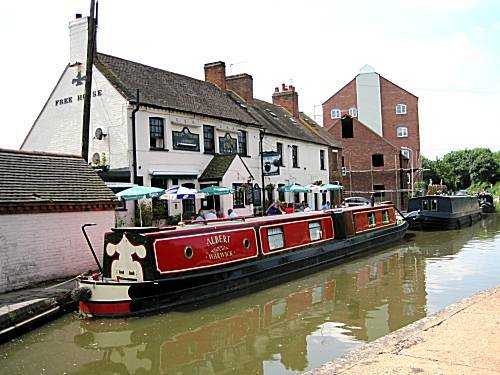 Should they moor here knowing the pubs and facilities, in the area, are of a poor standard or should they continue onwards to attempt to overnight at 'The Anchor' in Hartshill? 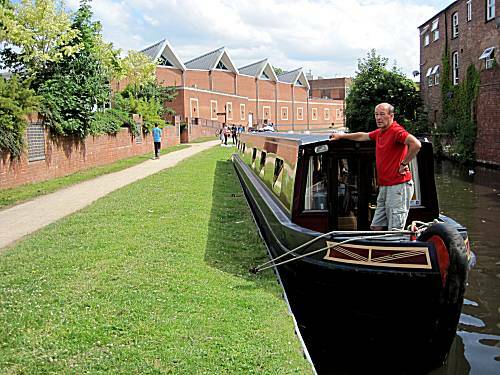 Although the latter sounded attractive, it would entail the risk of having endure the forecast bad weather, whilst they tackled the difficult flight of eleven locks through Atherstone. 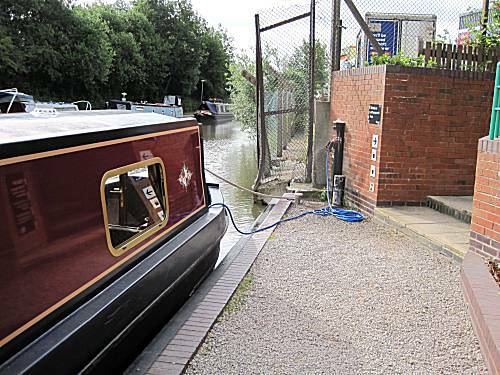 They deliberated for some seconds before opting to select the more taxing of the options, knowing that with their superior locking skills they were bound to reach Hartshill before the rain and storms started. They therefore proceeded through Polesworth without stopping!! The crew again succeeded with their mission to complete the Atherton Flight of 11 locks in a record time. 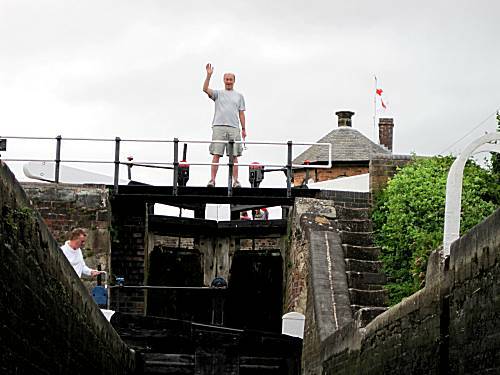 Other boats travelling through the locks at the same time benefited from their speed and offered them their sincere thanks on reaching the top. 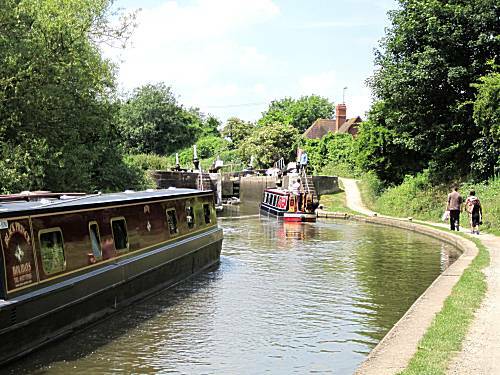 As can be seen, immediately after reaching top lock, they moored to finish their small portions of Pork Pie with a little Branston Pickle (small chunk variety). The celebration also called for the crew to share their last remaining Hot Dog rations, which were much enjoyed, followed by the remaining Fresh Fruit Salad. 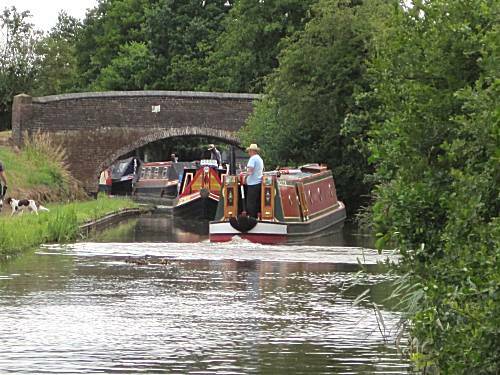 The crew were jubilant on reaching Hartshill by 4pm and before the onset of the forecast storms. Whilst Neil took a short walk before it lightly rained, the other crew took the opportunity to have a well deserved rest after the traumas of the day. After showers, they rushed the short distance from the boat through the garden of the pub to the bar where they were intrigued to find only 'Everards' ales on offer. Tiger bitter was selected for the evening and Neil negotiated with the helpful staff a private dining room, where a television was set up, so that they could watch the Spain v Germany match, which started at 7-30pm. Fish Pie and Chicken Curry dinners were enjoyed in a downstairs private room with the staff bringing extra supplies of ale whenever the crew's glasses showed signs of getting dry. The crew enjoyed their night at The Anchor and returned to the boat to discuss possible stopping places for the following day. 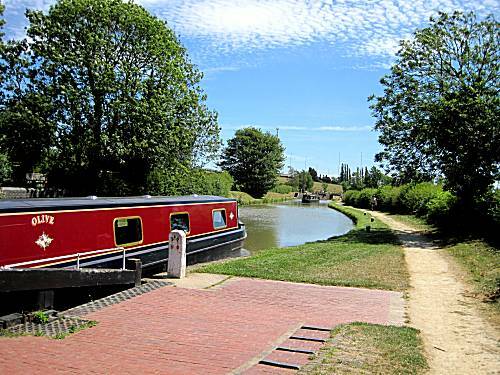 Although the 'Rose and Castle' at Ansty had been pre-selected, this would not require more than a few hours cruising and Alan suggested that they travel on to Rugby in search of Chinese Food. Neil was not convinced of the wisdom of this and preferred to take advice from any random passing boater. The others on hearing this decided to retire to their bunks. The crew woke up to a dull day, brightened only by Neil's positive porridge. Casting off later than usual, at around 8-30, it was not long before a few drops of rain fell on the crew. However, this did not last long and they were soon travelling through Nuneaton on the way to Bedworth. 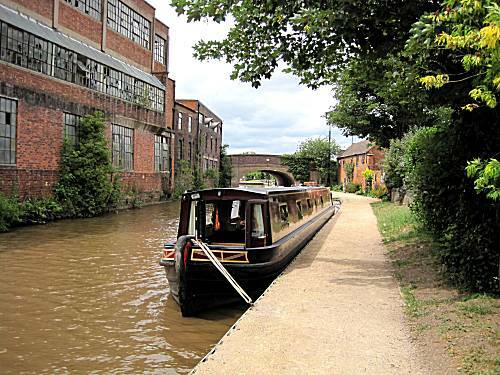 The realised that they had reached Bedworth when they passed the tidy and neat boatyard called "Charity Dock"
The crew were anxious to improve their detective skills. 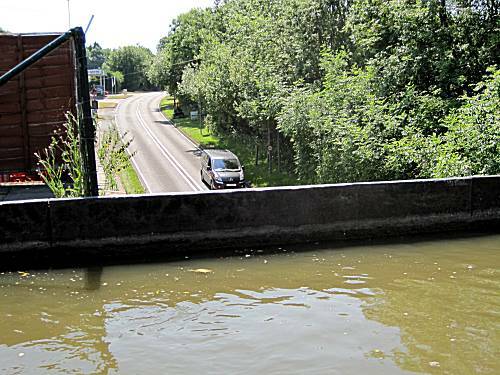 Knowing of the Newdigate Arm of the canal which loaded coal from the Newdigate Colliery, they successfully found the only remains, seen on the left. 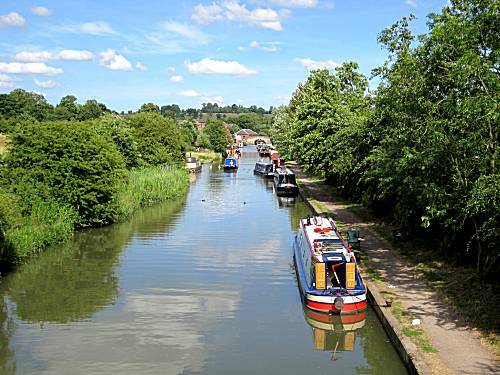 The crews superior detective skill also managed them to successfully locate the only remaining evidence of the original route of the Oxford Canal. It was not long before they arrived at the Hawkesbury Junction where the crew knew that they must make 180 deg turn in less than the length of the boat!! 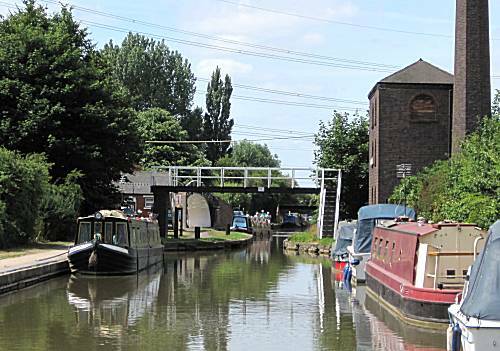 The crew knew that Hawkesbury Junction was going to be an impossible task, when they spotted, in the distance, a much shorter Canaltime boat stuck fast in the turn. 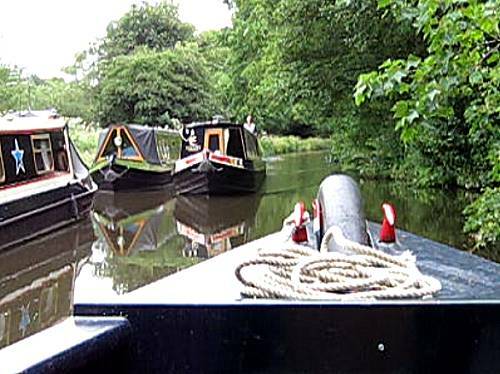 Dangerously the crew held their boat against the current whilst they shout words of encouragement and instruction to the other narrowboat, which had inexperienced crew. The impossible 180deg turn was handled with easy, much to the admiration of those sitting outside the Greyhound Pub. 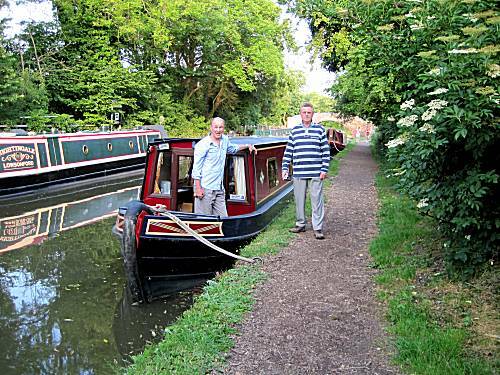 Some of the crew used their free time at Ansty to taking refreshing country walks, whilst Alan was left in the boat to complete necessary mundane tasks. The crew looked forward to a penultimate night of food and merriment at the 'Rose and Castle' opposite, knowing that their chances of completion of their difficult mission looked promising. The crew showered and hurried across the bridge to reach the Rose and Castle, cunningly selecting 'Old Hooky' ale for their enjoyment. 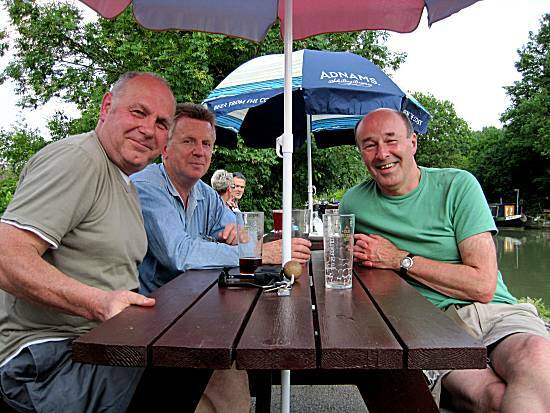 As the weather remained good they elected to take their food and drink in the extensive garden overlooking the canal. Gammon dinners were chosen (except Ron - Curry), which proved a good choice, although Ron was disappointed with his curry and remained somewhat hungry. 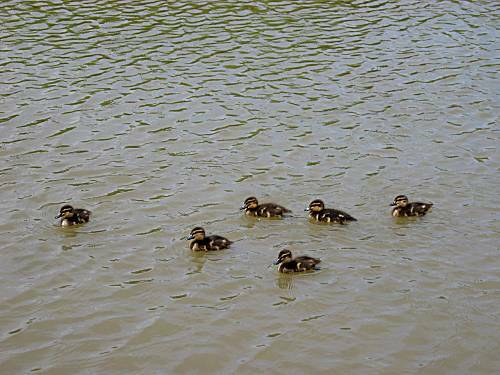 A few drops of rain drove the crew to return to the boat, but were quickly reminded that supplies of cheese on board had been exhausted. 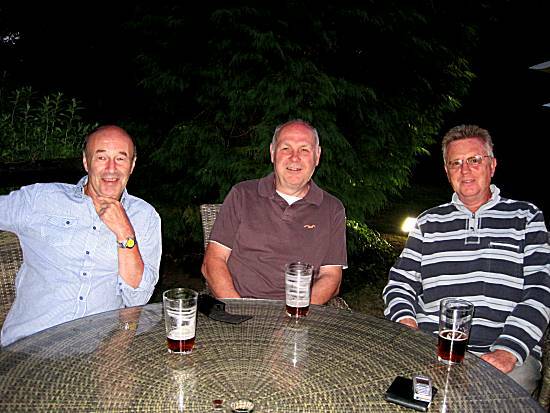 They therefore retired for an early night contemplating the successes of the adventure so far, but also aware that the Newbold Tunnel (250yds) would have to be tackled before they reached the relative safety of Rugby. Although the crew rose early for their portions of tunnel nourishing porridge, they were aware of much other boating activity in the vicinity. Several narrowboats passed them, whilst they were still moored and they also watched the attempts of nearby Black Prince boat to free themselves from grounding after the bridge. 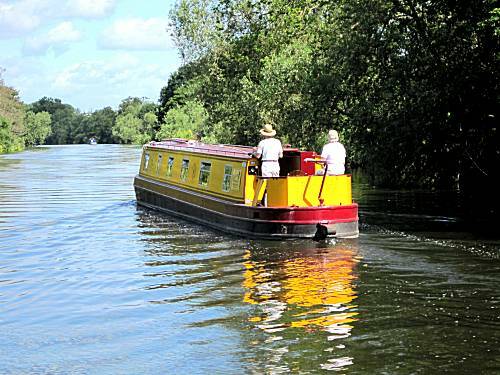 They cast set off quickly joining a precession of narrowboats stretching into the distance. 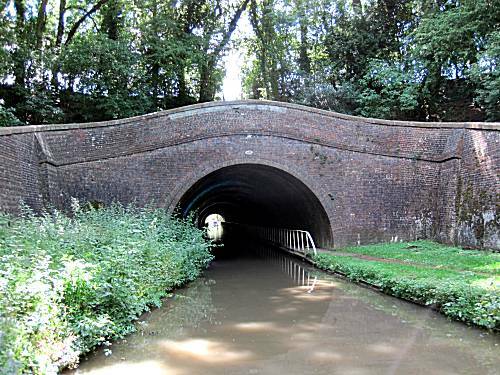 The crew felt uncomfortable in this situation as they were used to having much of the canal system available for their sole use. Crowds of boats were witnessed ay 'Stretton Stop', a potential water filling location, but the crew elected to continue knowing too well that their fresh water supplies remained dangerously low. Only too soon the giant 'Newbold Tunnel' appeared before them. 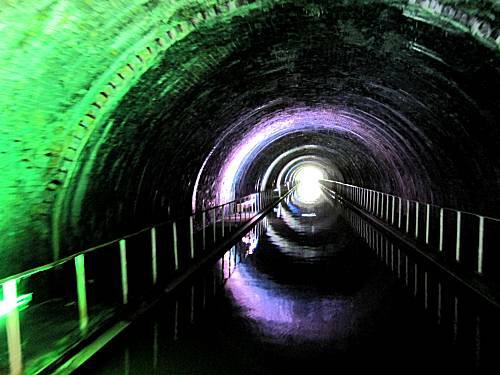 The crew were aware that this was the longest tunnel of the whole adventure and knew that this could cause disaster to curtail the entire mission. They tasted fear as they entered the narrow entrance. Cunningly, immediately upon safely exiting the eerie tunnel, they located fresh water supplies and stopped to replenish their tanks, whilst sharing the last of their coffee rations, together with nerve calming Hob-Nobs. 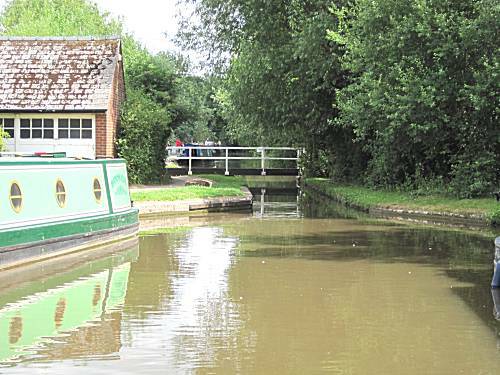 The last three locks of the adventure were handled with characteristic expertise by the crew as they wound their way onward to reach Braunston for the evening. Although this was some considerable distance the crew knew that with the speed of their boat this could just be accomplished before nightfall. 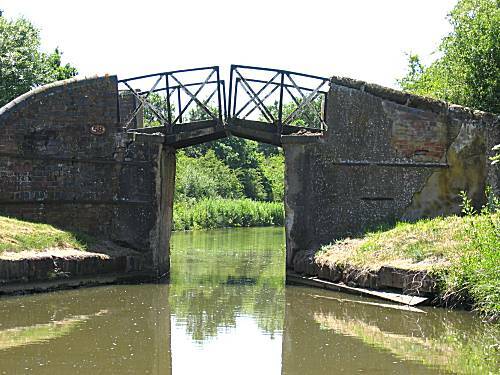 Once the last of the three Hillmorton Locks were conquered the crew moored to finish much of their food rations. Egg and Bacon sandwiches were prepared followed by fresh fruit salad, accompanied with fresh orange juice topped up with sparkling Harrogate Spa Water. The crew felt good after this lunch and ready to tackle the last difficult section of their journey that day. 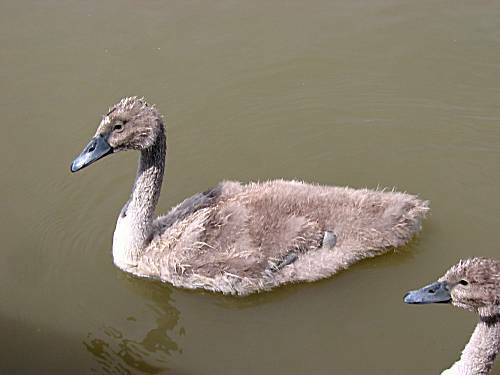 The crew soon came across an inexperienced lone female in a narrowboat travelling at barely over 2 miles per hour !!! Although the crew politely followed at this slow speed for several miles, they were aware that this would jeopardise the success of their mission. The crew considered careful nudging her rear end, in order to pass, but elected to encourage her to moor, to enable the considerate crew to continue with their mission at full speed. With their problems behind them and the weather becoming hotter than ever the narrowboat battled onward through the impossible waters. 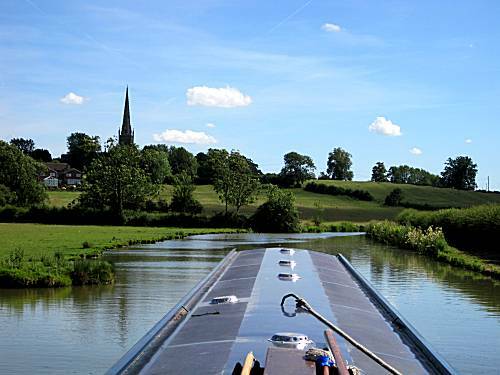 Eventually in the distance the spire of Braunston Church came into view and the crew rejoiced. 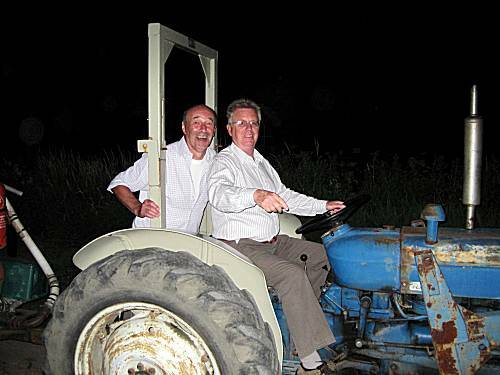 The perfect mooring spot was located and Alan & Neil went to investigate the village, locating The Old Plough for their evening's entertainment. Alan and Neil rejoined Ron on the boat to ready themselves for their last night out before returning the boat to boatyard in the morning to complete another dangerous mission. 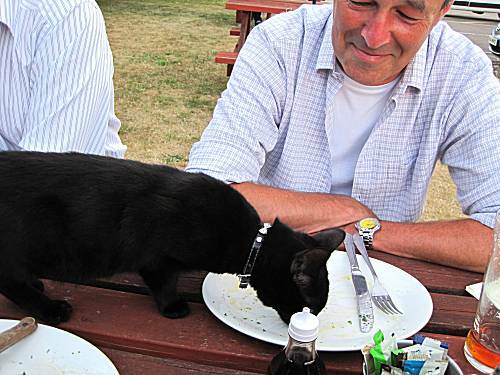 The crew enjoyed healthy dinners, finshed off by the local pub cat at the Old Plough, accompanied by Adnams Broadside Ale. 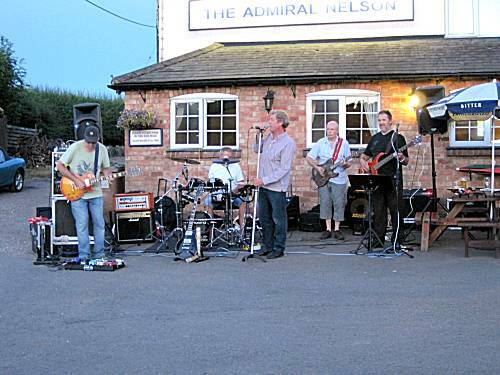 Afterwards they made their way some distance to enjoy a last pint together at the Admiral Nelson, where they remembered stopping on many previous adventures. The villagers had laid on special transport back to the boat for the important mariners, for which they were very grateful. 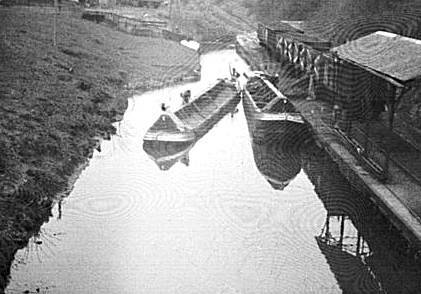 The crew had previously calculated that it was just less than 5 miles for the narrowboat to travel back to the boatyard in the morning and as they were confident that there would be no further disasters on such a short section they retired to their bunks having decided to rise at 7am with a view to departing by 7-30 to complete their mission. The rested dreaming sweetly of success and seeing the loved ones yet again. The crew rose before 7am eager to complete the last short section of the journey back to Napton and the boatyard. Nothing could really stand between the crew and success!! 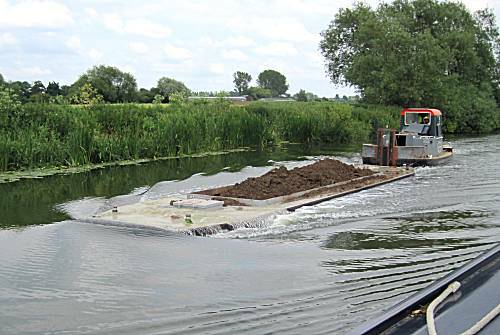 The crew could not believe their eyes when they found the canal almost blocked by a large sunken barge, less than a mile from the boatyard. Surely this could not signal failure of their entire mission by failing to return the boat safely to the boatyard before 9-30am. However, using their advanced navigational skills, they calculated a method of getting their 70ft narrowboat through the small gap. This was executed with extreme skill and enabled the mission to continue. 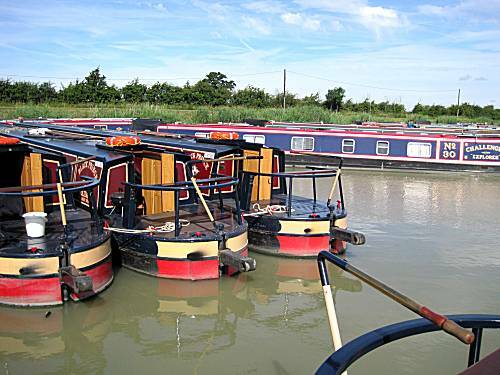 A queue of Black Prince narrowboats could be seen by the boatyard unable to make the sharp turn in the narrow entrance to the marina. The crew again took command of the situation by showing the others how to make such a difficult turn. Once in the marina the crew moored the narrowboat next to it's 'friends'. The boatyard staff welcomed the crew back, totally bewildered by how the crew could have achieved so much in just two weeks. The crew loaded their belongings back into Neil's car and they returned home discussing the successes of the venture and secretly planning their next trip in September.